Unlike conventional EDXRF analyzers, the NEX CG was engineered with a unique close-coupled Cartesian Geometry (CG) optical kernel that dramatically increases signal-to-noise. By using secondary target excitation, instead of convention direct excitation, sensitivity is further improved. The resulting dramatic reduction in background noise, and simultaneous increase in element peaks, result in a spectrometer capable of routine trace element analysis even in difficult sample types. NEX CG is powered by a new qualitative and quantitative analytical software, RPF-SQX, that features Rigaku Profile Fitting (RPF) technology. The software allows semi-quantitative analysis of almost all sample types without standards — and rigorous quantitative analysis with standards. Typical uses of XRF include the analysis of petroleum oils and fuel, plastic, rubber and textiles, pharmaceutical products, foodstuffs, cosmetics and body care products, fertilizers, geological materials, mining feeds, slags and tails, cement, heat-resistant materials, glass, ceramics, catalysts, wafers; the determination of coatings on paper, film, polyester; metals and alloys, glass and plastic; forensics; multi-layer thin films on silicon wafers, photovoltaics and rotating storage media as well as pollution monitoring of solid waste, effluent, cleaning fluids, pools and filters. In addition, X-ray Transmission (XRT) process gauges are employed to measure sulfur (S) in crude oil and marine bunker fuel. XRF spectrometers are the elemental analysis tool of choice, for many applications, in that they are smaller, simpler in design and cost less to operate than other technologies like inductively coupled plasma optical emission spectroscopy (ICP-OES) and atomic absorption (AA) or atomic fluorescence (AF) spectroscopy. Examples of some common EDXRF applications are: Cement and raw meal: sulfur, iron, calcium, silicon, aluminum, magnesium, etc; Kaolin clay: titanium, iron, aluminum, silicon, etc; Granular catalysts: palladium, platinum, rhodium, ruthenium, etc; Ores: copper, tin, gold, silver, etc; Cement and mortar fillers: sulfur in ash; Gasoline, diesel and RFG: sulfur, manganese, lead, etc; Residual gas oils: sulfur, chlorine, vanadium, nickel, etc; Secondary oil: chlorine, etc; Kerosine, naphtha: sulfur, etc; Crude oil and bunker fuels: sulfur, vanadium, nickel, etc; Plating, pickling & pre-treatment baths: gold, copper, rhodium, platinum, nickel, sulfates, phosphates, chlorides, etc; Acetic acid: magnesium, cobalt and bromine; Terephthalic acid (TPA): cobalt, manganese, iron, etc; Dimethyl terephthalate (DMT): heavy metals; PVC copolymer solutions: chlorine; Photographic emulsion: silver; Clay: metals and non-metals; Waste and effluent streams: RCRA metals, chlorides, phosphates, etc; Food, pet food and other animal feed: potassium, phosphorus and chlorine; Cosmetics: zinc, titanium, calcium, manganese, iron, silicon, phosphorus, sulfur, aluminum, and sodium; Wood treatment: CCA, Penta, ACQ, ACZA, phosphorus-based fire retardants, copper naphthanate, zinc napthanate, TBTO, IPBC and combinations of these; Antacids: calcium; and Toothpaste: phosphorus and tin. 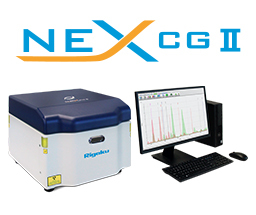 Unlike conventional EDXRF analyzers, the NEX CG was engineered with a unique close-coupled Cartesian Geometry (CG) optical kernel that dramatically increases signal-to-noise. By using secondary target excitation, instead of conventional direct excitation, sensitivity is further improved. The resulting dramatic reduction in background noise, and simultaneous increase in element peaks, results in a spectrometer capable of routine trace element analysis even in difficult sample types. Up to five polarization and secondary targets cover the complete elemental range (Na-U) with optimized sensitivity. As illustrated in the spectral plot (left), cartesian geometry with secondary targets and polarization delivers exceptional signal-to-noise (orange spectrum) as compared to a conventional direct excitation EDXRF system (blue spectrum). With the patented Rigaku UltraCarry, you can use your Rigaku NEX CG spectrometer to quantify trace elements in aqueous liquids down to parts-per-billion (ppb) concentration levels. Routine elemental analysis of contaminated water or industrial wastewater can now be performed without an Atomic Absorption (AA) or Inductively Coupled Plasma (ICP) spectrometer. UltraCarry based trace element analysis is suitable for use by non-technical personnel. 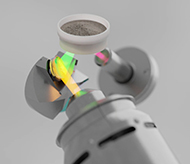 UltraCarry is a novel disposable (single-use) sample retainer for X-ray fluorescence (XRF) analysis that is used to preconcentrate a liquid sample into an uniform sample carrier that is optimized for the suppression of background noise. This approach dramatically improves the signal-to-noise ratio, resulting in almost three orders of magnitude improvement in the Lower Limit of Detection (LLD or LOD) and Limit of Quantification (LOQ) for heavy elements. The UltraCarry sample retainer comprises a ring-shaped support fitted with a X-ray transmissive hydrophobic film and central liquid absorbent element pad. 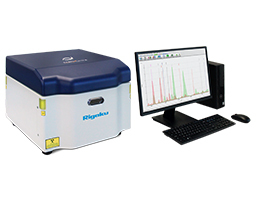 For routine analysis using UltraCarry, a recommended vacuum dryer apparatus — Rigaku UltraDry — is available as an XRF accessory.